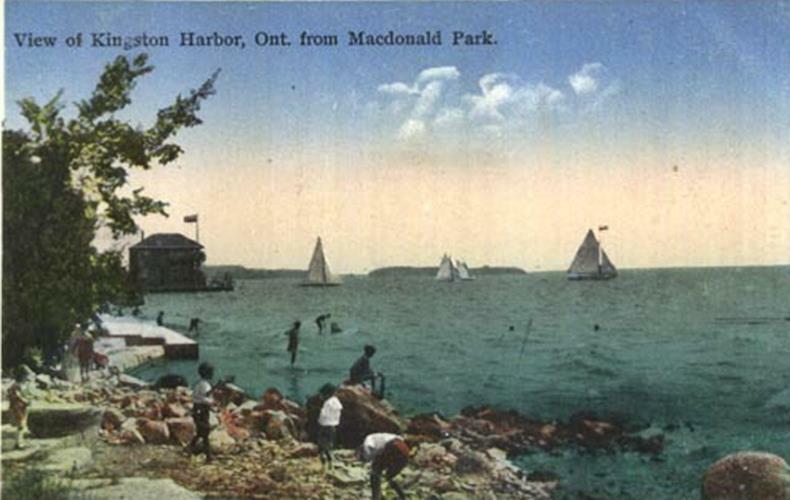 As an early Kingston newspaper noted, the City is situated on “a magnificent sheet of water, not second to any in America for yachting purposes”. It is no wonder, then, that yachting and boating in their various forms, have been part of harbour scene for some two hundred years. Kingston Yacht Club, as we know it now, coalesced out of mid – 1800s informal regatta associations and failed earlier attempts to form a club during that period. Kingston’s sailors did not let the absence of a club prevent them from winning prizes at events around Lake Ontario under the ad-hoc organizations of the day. What seems to have been the trigger to the creation of KYC was the formation of the Kingston Ice Yacht Club in 1895. This group of 30 members set up their facility at the foot of Simcoe Street, and made use of the good ice conditions available to enjoy their fast and dangerous sport. The KIYC was so successful that its membership had multiplied several times over just by 1896. 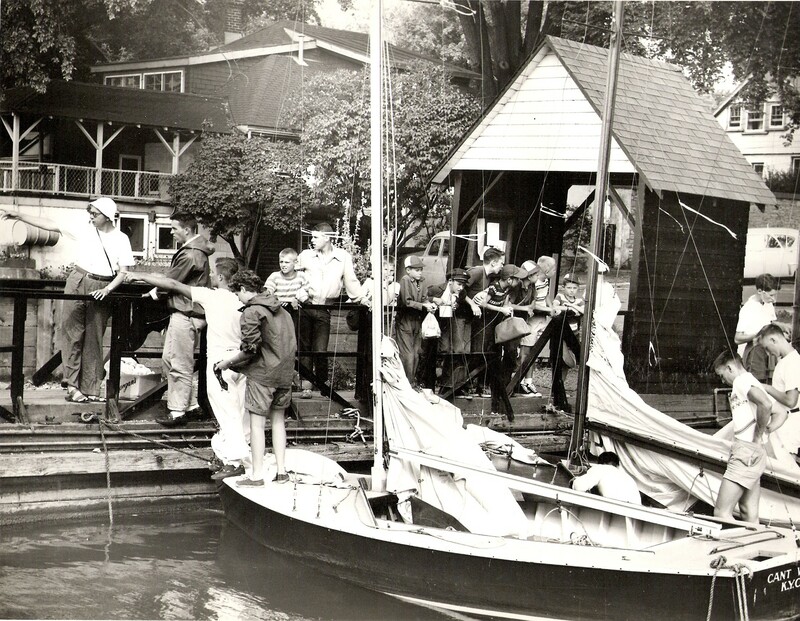 Many of these people were also summer sailors and a group of them decided to form the Kingston Yacht Club that continues to provide a venue for sailors, young people, and social members 113 years later. The new KYC was very fortunate in being able to obtain waterfront land from the Maitland Street owner of what was known as “Cameron’s Wharf”. Part of this property included a boat yard, as well as boathouses. In short order the Club raised the sum of $1250 needed to build a clubhouse on the wharf, and this building was opened on 3 August 1896. The clubhouse was a 40 x 40ft, two-story structure, with canoe and skiff storage on the ground floor, with a large club room above. The gala opening party was held on 12 August, and was favourably reported on in the “Daily Whig”. In short order the Club joined the Lake Yacht Racing Association, and was able to host the 1897 and 1898 LYRA regattas, complete with a military band, church parade, an evening steamer excursion and much revelry. Over the next ten years KYC expanded its property and Club moorings to accommodate the rapidly-growing membership. This expansion included acquisition of the “Saints Rest” stone building, now Club-owned apartments and training facilities. In addition, the Club secured the use of a landing on nearby Cedar Island for picnics and parties. At this time the familiar local names of key Club members keep popping up: Cunningham, Dalton, Hill, Gildersleeve, Carruthers, to name a few. Their descendents are active in the Club to this day. Encouraging junior sailors has always been a part of KYC operations, and in 1911 the Club offered “$100” for the building of dinghy-class boats for training the younger set. Disaster struck in 1934 when the original clubhouse, modified several times, burned to the ground, a complete loss. A new building was erected by mid-1935, and was opened by the Governor General, the Earl of Bessborough, amid all the expected pomp and ceremony. The Club at this point had over 400 members and was active in community and later, wartime, affairs as well as its own. On into the 1960s and beyond, KYC was a key player in hosting trials for the Olympic Games in 1967, and the subsequent CORK organization and annual trials. During the last few decades KYC has continued to evolve, host and participate in all forms of yacht racing, still its core activity. With all its other activities, and a very large cadre of volunteers to run it, KYC is simply the place to be on the Kingston waterfront.